Sometimes, you deserve a little treat and our extra special banana bread is just the thing! 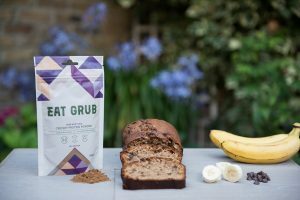 In our recipe, the cricket powder (also known as cricket flour) adds a delicious nutty flavour which complements the sweet flavour of the banana. 01 – Preheat the oven to 180°C/350°F/Gas Mark 4. Grease your loaf tin and line with non-stick baking parchment. 02 – Measure all the ingredients into a bowl and beat until the mixture is smooth. Ideally, use an electric whisk to avoid any lumps, but this is not essential. 03 – Spoon the mixture into the loaf tin evenly and put on the middle shelf of the oven. Bake for approximately one hour. To check the cake is done, insert a skewer into the top of the cake which should come out clean. There you have it… cricket powder banana bread!